The stand alone installation configuration is often the most efficient. 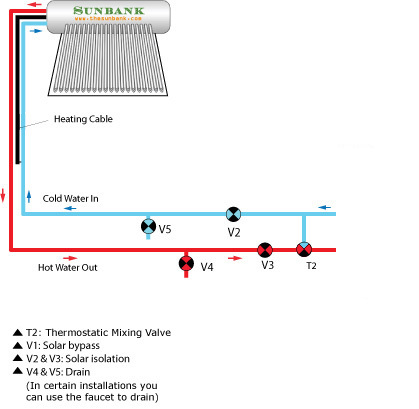 With this configuration, the Sunbank is installed with the auxiliary heater and Sunbank Controller, and is plumbed directly into the most accessible and closest water pipes. This installation is often the simplest because you don’t need to chase to the existing water heater. Some other advantages are that you are using solar heat to maintain the hot water temperature in the tank and you are not maintaining hot water in an additional gas/electric water heater. The stand-alone installation can also be installed in addition to your existing water tank, and in that case the water will flow from the nearest source. This is an unusual but possible application, especially for a large house. For example, with a Sunbank on a roof and a conventional heater in the basement, the upstairs showers will pull from the Sunbank and the laundry downstairs will pull from the conventional heater. This path of least resistance strategy will shorten all the hot water runs in the house, which means hot water will arrive faster and less water will be wasted. The stand alone installation configuration is often simpler and more efficient but in certain instances it is not the best choice. Some examples of when it is better to preheat: if the solar water heater is only providing a small percentage of the overall heat or if you would prefer that your backup heat be gas because it is less expensive than electricity. Also, in some climates that experience cold winters you might prefer to have your backup heater inside during the winter. When you install the system as a backup with a bypass you have the flexibility to use the backup heater or revert back to a stand alone installation – the best of both worlds.